Three days of closely fought racing characterised the 2016 edition of the Loro Piana Caribbean Superyacht Regatta and Rendezvous. There were notable battles and tactical duels in all four classes, with 21 superyachts, their owners and crew showing their worth in winds of 18-24 knots over a memorable 72 hours in the British Virgin Islands. 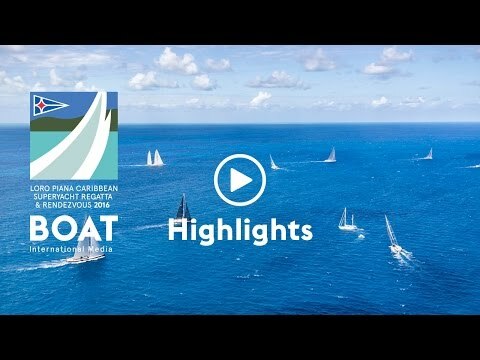 Click here to see all the results from the 2016 Loro Piana Caribbean Superyacht Regatta and Rendezvous. Honours were more even in Class B, which saw a different winner on each of the race days; just two points separated the top four boats in the final classification. The 2015-launched Unfurled took a convincing victory in the first race but an equipment failure in Race 2 prevented her from finishing, enabling the 60m Hetairos to take the win. The third and final race saw the the 38-metre Perini Navi yacht P2 cross the line ahead of Unfurled and take the overall win in the class. Another Perini Navi yacht, the 59-metre ketch Seahawk featured prominently in Class C, taking an early lead that she consolidated with a second bullet in Race 2 ahead of the 50m sloop Ohana. A hard-fought battle in the final race saw the Dubois-designed Bella Ragazza nip across the line just five seconds ahead of Seahawk, landing her second place overall. Seahawk ended up top the class following her good start and Ohana was third. In Class D Donald MacPherson’s Swan 90 Freya dominated from the outset, posting consecutive wins in each of the three races. Second place went to the Oyster yacht Maegan and the Southern Wind yacht Blues came in third. The participants and spectators enjoyed a busy schedule both on and off the water, coordinated by the organisers, Boat International and the Yacht Club Costa Smeralda. Certainly those who attended and enjoyed the sailing, the social programme and saw the motor yacht fleet taking part in the Westport Rendezvous would not disagree. For those planning on returning to the Caribbean next year, the date for your diaries is March 10-13 next year, the 2017 edition of the Loro Piana Caribbean Superyacht Regatta and Rendezvous.